Classic tones meet playable design. In our opinion, it's the best of Fender's new American Vintage Teles. Authentic spec (thankfully, with the exception of modern wiring). Fantastic tones. Top-notch build quality. Manageable neck. Steel saddles. Only a handful of classic-era electric guitars genuinely qualify for the tag of "the only one you'll ever need". Gibson has one, the fabulous ES-335, and Fender can boast two; the Stratocaster and the Telecaster. Here we look at the new Vintage '64 Telecaster from Fender's completely overhauled American Vintage range. "It's remarkable just how much the neck and even the body shapes have altered since early-era Telecasters"
Your humble scribe has been around Teles of all eras, both as a player and repairer, and it's remarkable just how much the neck and even the body shapes have altered, how the transition from one curve into another can vary drastically, and how tiny variations in edge radius - even as inconsequential as those round the headstock - can drastically alter the vibe. Fender has spent the last 30 years re-learning its past and with the new American Vintage range has homed in on what it sees as the three essential vintage Teles: the quintessential ash-bodied 'black guard' '52; the slimmer-necked '58, also in ash; and the rosewood 'board '64 (reviewed here) that's generally alder-bodied, but employing ash for the White Blonde colour option. Fender has gone to town on accuracy, too, having used several great originals as benchmarks. First bone of contention: the blonde finish. Chris Fleming says: "It looks to me - this is what we believe - that the 1952 Teles were originally blonde and they turned a bit brown-ish or butterscotch or yellow over a period of time because of the formulation of the lacquer they used. Then in '65 or so the lacquer changed and it stopped yellowing in that way and started looking like the American Vintage '58 Telecaster, which is kind of a whiter blonde. After the colour we put on a thin clear top coat. "So all of the guitars have a base, white wash coat but the blond Teles and the one blonde Strat all have a sunburst around the edges in white, including the '52 Tele, which then gets its extra colour. We spent a lot of time on this and it was really hard for production to get consistent colour matches. But now we're pretty happy." The new 'Flash Coat' lacquer finish does drag, but we found a silicon-impregnated cloth helped. For certain, this guitar feels tougher to play than more modern Standards and super-tweaked Custom Shop models. Tougher isn't always negative, however - many players insist on some fight in the guitar to bring out the best in their technique and tone. "The '64's 'round-lam' rosewood 'board, coupled with a C-shaped neck, proves to be an all-round player-friendly experience in our opinion"
Either way, the '64's 'round-lam' rosewood 'board, coupled with a C-shaped neck, proves to be a good halfway house between the two schools of thought - an all-round player-friendly experience in our opinion. The playing surface's lack of sheen and the micron or two of lacquer that's missing gives the impression of more fret beneath the fingers. Bends and vibrato are accessible, even those down near the nut, and there's a feeling that this is a more modern guitar, despite the ubiquitous 184mm (7.25-inch) radius. You'd have to say that these days, what with flatter fingerboards and bigger frets being the 'norm' on Fenders rather than the exception, it's easy to forget how early Fenders were trickier to play in some respects and easier in others. For instance, try bending the third string at the 2nd fret for your archetypal Muddy Waters or Hendrix blues lick; you might find the string slipping from under your fingers due to the low wires. Conversely, bash out barre chords for two hours and the cambered 'board makes it easy, whereas on your modern 'flat board and big frets' Fender it can be tiring. For years we got around the fretting issue by perseverance, and the fact that if the old guard could do it, then nothing was going to stop us trying. Just as with the Strats, if you use a lot of string bending in your playing, you will need to have that action higher than you would on a flatter 'board. It's a matter of preference though. Overall, it's hard to criticise this Tele from a build quality or authenticity standpoint. Some of the inherent simplicity and rudimentary nature of the build and component choices are exactly what makes it vintage-correct. You either accept those era-related spec and playability issues as an essential part of the tone and experience, or go elsewhere in Fender's vast range. What is unavoidable after the generally easy nature of American Standard guitars and the like-an-old-pair-of-shoes instant satisfaction of Custom Relics, is just how squeaky new they feel. Getting them bedded in how you like them will take a while - only you can decide if you want to put the work in. For context, some of the Guitarist magazine staff have commented that it's the only way to truly end up bonding with a guitar, and also explains their reluctance to chop and change axes with any regularity. The right Tele usually ends up being a lifer, in our experience. "We can't stress enough how important it is to plug this guitar in, turn it up, and feel the difference for yourself. And, yes, we mean 'feel' as much as we mean 'hear'"
The various eras produced recognisably different Tele tones - some darker, some twangier. This is partly down to wood choices, but the pickups also changed, in their magnet types, wire gauge and so on. Even the bridge saddles can have a significant effect on the sound of the guitar. Recording, too, can flatten things out once you've been through mixing and mastering, so we can't stress enough how important it is to plug this guitar in, turn it up, and feel the difference for yourself. And, yes, we mean 'feel' as much as we mean 'hear'. Thankfully, the guitar retains modern wiring, not the archaic pre-'67 style that's at odds with today's tastes. On plugging in the '64, the immediate cry was, "You can really hear the rosewood." Indeed, you can. 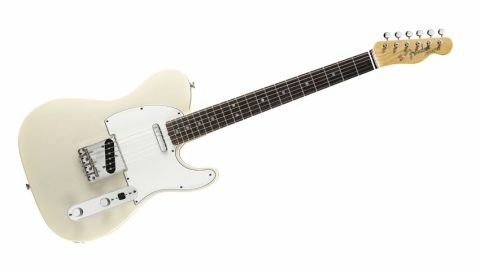 There's a dark warmth here that's absent in the other new Teles in the range, and an early Beck-Kinks-Stones-style wiriness that the others don't quite have. We like the threaded steel saddles, too, because they allow basic string spacing adjustment and always seem to sound great. This is definitely a versatile Tele, and thanks to that rosewood 'board, the most playable in our opinion, too. The aforementioned '52 kicks a little harder, tonally, but all else considered, this is the guitar that won the most Telecaster votes cast in the Guitarist office. If we owned it, we might even be tempted to fit the '52's pickups (sorry, Fender).